This was a promotional item at the Mobile Gas Stations in New Zealand. 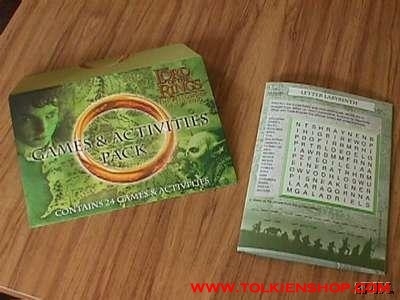 It is a Game and Activities Pack that contains 24 games, puzzles, and coloring activities. The envelope contains a 24 page unbound booklet with various activities for kids while driving around I suppose since it came from a gas station. There are word searches, pictures to colour, find the enemies in the picture, connect the dots, mazes, map puzzle, spot the difference in the pictures, code decipher, and crossword puzzles. There are no boardgames here. This is really just an activities book. But it is LOTR related. The levels of difficulties vary, but there is nothing too hard. Adults can figure out the puzzles, but a younger child might have some difficulties. My guess is this for an age level of about 8 to 12 year old, give or take. I enjoyed figuring out some of the puzzles, but I am just a big kid.